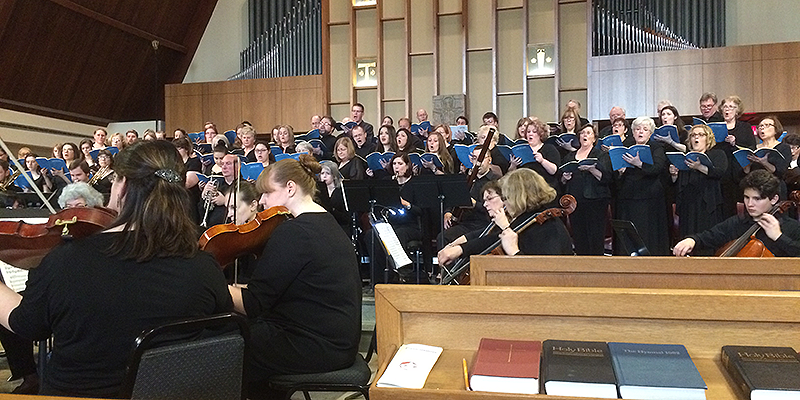 The Brandywine Symphonic Chorale debuted as a branch of The Brandywine Singers organization in the fall of 2015, and is devoted specifically to the presentation of larger works from the choral canon. Last season included Vaughan Williams Fantasia on a Christmas Carol, as well as a collaboration with the Chesco Pops Orchestra in a hugely successful presentation of Mozart’s Requiem, featuring soloists Stephanie DeFelice Heavens, Emily Bullock, Daniel K. Williams, and Richard Zuch. This year’s holiday program will include the Vivaldi and Rutter Glorias, and our spring concert will include Rossini’s moving Stabat Mater. The chorale is non-auditioned and open to all members of our community who share our love of music. Rehearsals for Symphonic Chorale occur Tuesday evenings at Church of the Good Samaritan in Paoli (212 W. Lancaster Ave.) from 7:00 to 8:30 pm, beginning January 22nd. If you would like to sing with the Brandywine Symphonic Chorale, or become one of our patrons, please contact us for more information!